Ok, I bought my Skunk2 Pro2 cams for $650.00. Skunk2 Pro Series Valvetrain(Valve Springs, Valve Spring Base Kit, & Retainers) for $550.00 off ebay. I also replaced my valve seals in order to remove my stock valve spring base, H22 Headbolts(OEM), intake cam plug seal, cam seals(Cam Gear side), and stock OEM Honda headgasket, so all of these are new when I rebuild my H22 head. 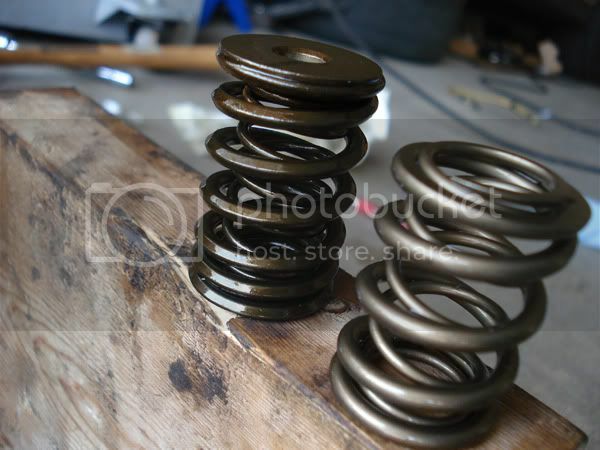 Beware guys that you'll need to remove(it'll get damage) the valve seals to get the stock valve spring base out. It's a PITA to remove them!! Use pliers and wiggle them out. 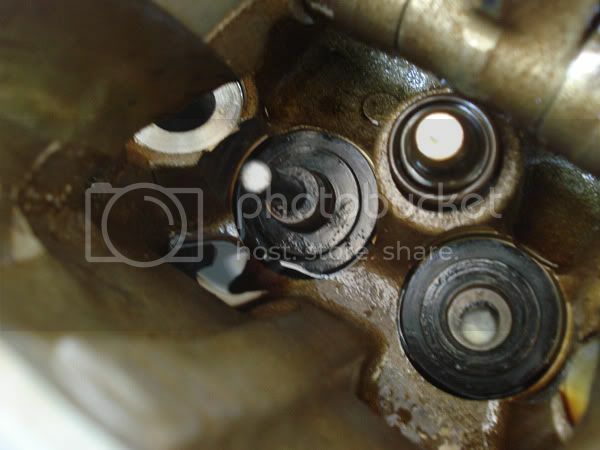 Also, beware that you'll need to tighten up the adjustable cam gears before you turn over the engine. I didn't do that to the exhaust cam gears and left it at 0 degree while I adjusted the intake cam gear to +4(setting recommended by S2) and the exhaust cam gear degree'd itself clockwise maxed out while I was running the motor and starting it up 2-3 times. I was worried that I'd bent some valves but I guess I was fine. Sounded better after zero'ing the exhaust cam gear back into position. The motor won't idle; it'll shut off if I let go of the gas pedal. Then my neighbor and I adjusted the butterfly to open up more so more air can enter and after messing around with the TB, we were able to make it idle at 1.1K-1.5k and not shut off. But if I go and start it up, I'll have to give it gas to make it fire up. I thought I was gonna be near or a little over 200whp, but I guess 187whp will do. My torque is over 150 cause it was at 147wtq when it was 181whp on the dyno. Last edited by Nusdogg; 05-28-2010 at 05:11 PM. I'm going with Mahle 11.5:1 compression pistons, ACL Race bearings, and rods(don't know what brand yet). That should up my whp over 200 easily I guess cause right now I lost tons of power when I'm on the street racing against another H22. I raced my buddy's JDM H22A BB1 Lude and we were neck to neck after my cam installed. Before that, I would take him 2-3 cars instantly when we do a 40 roll on the highway. niiiceee i love threads like these. those numbers aren't too shabby either. what kinda header/exhaust setup? Yeah, numbers aren't too bad consider I'm still stock compression. And at least I'm near 190whp. Once I ordered my new 11.5:1 pistons, etc, I should be over 200whp. But those numbers are nothing compared to when I'm on the street. I'm a little bit slower than before. I'm using ebay header with stock cat. I also have a 2.5" custom piping exhaust with my Apexi WS2 muffler. 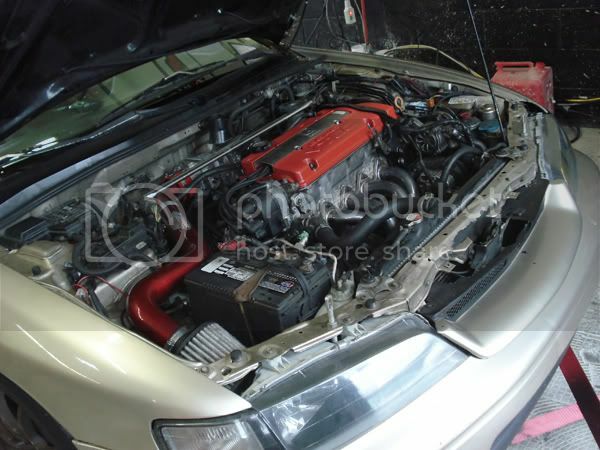 I will be getting a Hytech Replica header as well; since, they're proven to gained 10-15whp untuned. You're right, 3" piping exhaust should definitely help it alot; even other guys told me so. I heard my WS2 muffler is very restrictive and that I should go with a different style muffler, but I love my WS2. OEM look all the way. Also, I'm running a AEM SRI. The AEM piping is only 2.25"; I'm planning on going 3" intake piping. Should help also. I need to get some 3'' exhaust on mine and retune! Thanks. Me too. I want a 3" exhaust for my setup now. I should've gone that route, but oh well. 2.5" should suit me for now. Im confused. WHy on earth did you lose power? Was it the dyno tune? Thanks. Yeah, thats pretty much all H22s with Pro2s will sit after a tune with stock compression. And no, I should've asked him why there's that dip cause my brother said the same thing about that dip. I'm not sure on that one. I'm debating if it's the dyno or if its something I did during the head build. I got the car up and running on Friday night, went out and did a few races then Sunday came, and I did a compression check which I got 200psi all across the cyl. So nothing seems wrong with any of my cyl. The graph shows that I put out 187whp and 150ish wtq, but on the street I'm not that fast as I use to be when I was stock cams. nice bro i like the new parts. 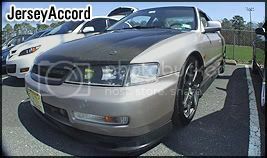 Nice accord man...I always wanted to put a h22 in my 96.
question, what'd you set the redline for? I gotta go with Neck on this one. Although, I wouldn't tackle any of this until you figure out what's up with that dip in your curve. I'm no expert, but it looks like something is a little off with your IGN timing around the VTEC crossover. But like I said...I'm no expert. And I'm also reallllly drunk. congrats of the build, looks great! Last edited by mr_y82; 05-29-2010 at 09:59 AM. hmm im just thinking like what MORE do you need to get over 200.. i mean you already have a fully built head and all bolt on and all this stuff i wouldve thought you should be putting down more power.. hmmm.. but i love accords especially yours.. your avatar and signature are awesome.. it almost makes me want an accord.. but ill stick with the prelude. hmm im just thinking like what MORE do you need to get over 200. My next move will be rebuild the bottom end. Mahle 11.5:1 pistons, rods, and ACL bearing. That should net me over 200whp on a dynojet. My engine redlines at 8K rpm before and after the dyno. I still need to build the bottom end for higher rev. Last edited by Nusdogg; 05-30-2010 at 07:05 PM. That should do er'. Although I guess that's about your only option for pistons other than OEM. Yup, I don't want to sleeve my motor, and my FRM sleeve looks clean when I got the head off. Did you get em' honed? Nope, I have never got them hone. Whats up peeps! After some thoughts, I've come to a conclusion that my egay stainless steel header and stock cat is whats holding me back from 190+whp & wtq. So I decided that getting a Hytech Rep header and hi-flow cat will help me see some decent gains. 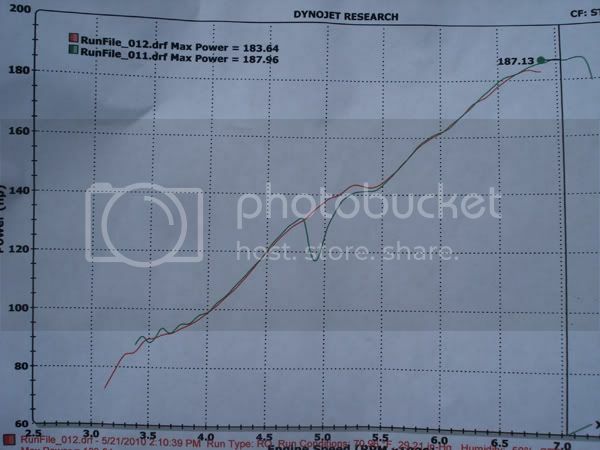 I've seen some Hytech Rep header dyno graphs on H-T, and I'm impress that it puts out some good numbers. I got my Hytech Rep Header just last week. I'm hoping for 195-200whp after the header & cat install, because I plan on going back to get my car re-dyno & tune but from a different guy whose pretty good at dyno-ing NA cars. So I'll come back with new results guys. Last edited by Nusdogg; 06-27-2010 at 08:19 PM. nice man, ya i wont that header!! lol i know with mine i pulled 202whp and 152 ft lbs. Yeah, I can't wait to get it install. mann, good luck bro. :D clean header. if i ever do NA, hahaha, naww NA 2 slow for me aha, but i Love reading up on this thread, very patiently/rightfully done.